Do You Want to Host Your Own Campaign? 1. Register to host a campaign. Registration is free and entitles you to use the Master Artwork, included with the purchase of a manual. By purchasing the manual, you will receive the Master Artwork with the registered trademark of WGYLM. You will be able to use the artwork on your own printed materials to publicize the campaign. The manual also contains instructions on how to purchase promotional materials (e.g., pens, stress hearts) for your campaign. 2. Purchase the manual, artwork, and instructions for proper use. 3. Buy promotional items. Promotional items can be purchased. Click Here for promotional item inspiration and instructions. Click to See a Preview! 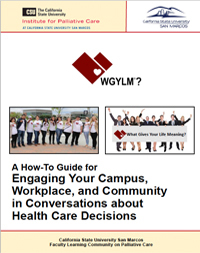 The WGYLM manual was written to help others to develop their own campaigns, based on the specific characteristics and needs of their organization. Purchase the manual to learn more about how to host a campaign and dozens of examples of activities that fit well in a variety of organizations. In order to obtain permission to use the artwork on promotional items, you must register for permission to use (registration is free).